"Not enough extension", the dressage judge wrote in her comments. "Horse got faster rather than lengthening." If Sarah got that comment one more time on her dressage tests, she thought she was going to scream. In an effort to get her horse to extend his trot and canter, Sarah squeezed her legs, she dug her seat bones into his back to drive him forward, she began wearing spurs with longer shanks…she pretty much tried everything. Yet her horse just got faster rather than extending. To see the difference between "faster" and "lengthening" (or "extending"), here is a horse in his early stages of training that gets quicker in the trot rather than extending (from 1:30 to about 2:15). In contrast, this horse is farther along in his training. He has been taught to lengthen his stride in the trot. Notice that he covers more ground with each step, and his pace doesn't change. The rider rises at the same even tempo, but her horse gets from one place to another a lot faster. One of the best explanations of extended gaits I've ever come across is in Walter Zettl's book Dressage in Harmony and accompanying videos (see links below). As he points out, the first step in developing extension is releasing the hands slightly forward so that the horse stretches and lengthens his frame to re-establish contact with the hands. As the horse's body stretches and lengthens, his gait lengthens as well. 1. Make sure you have a secure, following seat. If you are gripping anywhere, your horse will tense his body in response and this will interfere with his attempts to lengthen. Read more about that here. 2. Make sure you have an elastic rein contact. The key to extension is that when you push your hands slightly forward, your horse stretches his head, neck, and body in an attempt to re-establish contact. If your hands are stiff, rigid, loosey-goosey, or twitchy, he will feel nothing but relief when you release your hands forward, and will hardly be interested in res-establishing contact with those unpleasant feelings. In this video, you can see how unsteady the rider's hands are--and this rider is using a double bridle! The horse is doing the best she can to do what is asked, but that "in and out" and unsteady contact makes it difficult for her. Read more about how to develop elastic rein contact here. 3. Make sure you know how to execute a REAL half halt (and no, that doesn't mean slowing your horse down.) You can read more about that here. 4. Make sure you know how to engage his hindquarters. In extension, you need to "wind up" your horse's energy in his powerful haunches, then allow that energy to explode forward into your slightly released hands. Read more about that here. 5. Now you're ready to teach him to extend. Put him into a nice working trot, establishing a comfortable rhythm. Trot down the long side of the arena. When you approach the corner, half halt to shift his weight back onto his haunches, shorten your reins so that you take a firmer contact. Ride him this way through the short side and through the next corner. As you begin trotting down the long side, push your hands slightly forward towards his nose so that the rein contact softens just a bit (a very little will do), weight your seat bones a bit more, and squeeze your legs at or slightly behind the girth. Your horse should reach his head and neck forward in an effort to re-establish contact with your hands. The release should also allow all that power you built up on the short side to explode forward toward your hands. Squeezing your legs will encourage him to lengthen his body. And voila! You've got the perfect trot extension. Practice this pattern a few times so that you and your horse become accustomed to the feeling of containing the energy and letting it rush forward, winding up his body and letting it lengthen. Then try extending across the diagonal of the arena, being careful again to shorten his frame and gather his energy in the corners and short side of the arena. 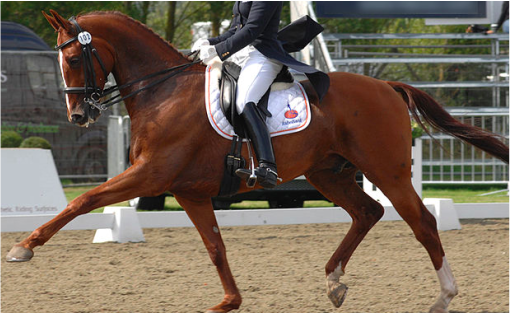 When you've got this down pat in trot, practice the same patterns in canter. Canter him down the long side of the arena, half halt in the corners to gather his energy and shorten his body, hold that energy on the short side, then let him explode down the long side of the arena by pushing your hands slightly forward. Eventually, your horse will start to feel like a stretchy, powerful rubber band that you can shorten or lengthen at will.